MINERAL, Va. - The most powerful earthquake to strike the East Coast in 67 years shook buildings and rattled nerves from South Carolina to Maine on Tuesday. 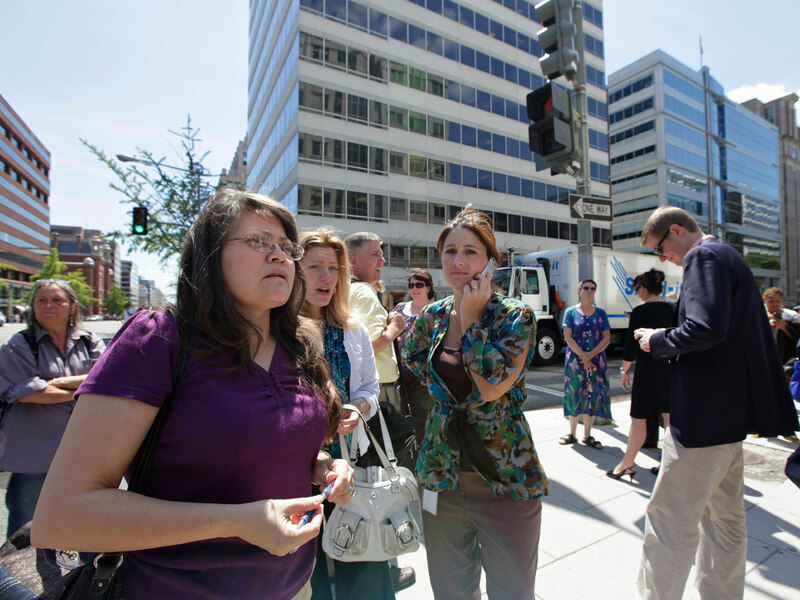 Frightened office workers spilled into the streets in New York, and parts of the White House, Capitol and Pentagon were evacuated. There were no immediate reports of deaths or serious injuries. The National Cathedral said its central tower and three of its four corner spires were damaged, but the White House said advisers had told President Barack Obama there were no reports of major damage to the nation's infrastructure, including airports and nuclear facilities. The National Parks Service says an inspection has revealed some cracking in the stones at the top of the Washington Monument. The NPS will have structural engineers evaluate the cracks on Wednesday to determine the best way to repair the Monument before it is reopened. The Washington Monument grounds have been reopened except for an area about 100 feet outside of the plaza. The U.S. Geological Survey said the quake registered magnitude 5.8 and was centered 40 miles northwest of Richmond, Va. The earthquake came less than three weeks before the 10th anniversary of the Sept. 11 attacks, and in both Washington and New York it immediately triggered fears of something more sinister than a natural disaster. At the Pentagon, a low rumbling built until the building itself was shaking, and people ran into the corridors of the complex. The shaking continued there, to shouts of "Evacuate! Evacuate!" The Capitol reopened for members and staff, but not for the public. The Park Service closed all monuments and memorials on the National Mall, and ceiling tiles fell at Reagan National Airport outside Washington. All flights there were put on hold. "The Washington/Virginia, Philadelphia/Atlantic City/Pennsylvania, and New York area airports, except LaGuardia, all suspended flights briefly so airport operators could assess runway integrity," said FAA spokesperson Kathleen Bergen. "Operations resumed as soon as the airports determined that the runways and associated equipment and facilities were not damaged. LaGuardia never stopped flights. Dulles never stopped arrivals and only briefly stopped departures." In lower Manhattan, the 26-story federal courthouse in lower Manhattan, blocks from ground zero of the Sept. 11 attacks, began swaying, and hundreds of people streamed out of the building. Why are East Coast earthquakes so widely felt? Quake shuts down 2 nuclear reactors in Va.
Workers in the Empire State Building spilled into the streets, some having descended dozens of flights of stairs. "I thought we'd been hit by an airplane," said one worker, Marty Weisner. Another, Adrian Ollivierre, a 28-year-old accountant who was in his office on the 60th floor when the quake struck, said: "I thought I was having maybe a heart attack, and I saw everybody running. I think what it is, is the paranoia that happens from 9/11, and that's why I'm still out here -- because, I'm sorry, I'm not playing with my life." New York Mayor Michael Bloomberg issued a statement: "Like people up and down the East Coast, New Yorkers across the five boroughs felt the effect of this afternoon's earthquake in Virginia. I've spoken with our Police and Fire Commissioners, and we've activated the Office of Emergency Management's Situation Room and spoken to other city agencies, including the Department of Buildings. Thankfully, there are no reports of significant damage or injuries in New York City at this time." Shaking was felt as far south as Charleston, S.C., and as far north and east as Martha's Vineyard, Mass., where President Barack Obama is taking summer vacation and was starting a round of golf when the quake struck at 1:51 p.m. EDT. The White House said that the president did not feel the quake. East Coast earthquakes are far less common than in the West, but they tend to be felt over a broad area. "The waves are able to reverberate and travel pretty happily out for miles," said U.S. Geological Survey seismologist Susan Hough. Amtrak said its trains along the Northeast Corridor between Baltimore and Washington were operating at reduced speeds and crews were inspecting stations and railroad infrastructure before returning to normal. More than 12 million people live close enough to the quake's epicenter to have felt shaking, according to the Geological Survey. The agency said put the quake in its yellow alert category, meaning there was potential for local damage but relatively little economic damage. The USGS said the quake was 3.7 miles beneath the surface, but scientists said they may never be able to map the exact fault. Aftershocks may help to outline it, said Rowena Lohman, a seismologist at Cornell University. There were at least two aftershocks, magnitudes 2.2 and 2.8. A 5.8-magnitude quake releases as much energy as almost eight kilotons of TNT, about half the power of the atomic bomb dropped on Hiroshima, Japan. The earthquake that devastated Japan earlier this year released more than 60,000 times as much energy as Tuesday's. "The whole building shook," said Jennifer Bundy, a spokeswoman for the state Supreme Court. "You could feel two different shakes. Everybody just kind of came out on their own." In Ohio, where office buildings swayed in Columbus and Cincinnati and the press box at the Cleveland Indians' Progressive Field shook. At least one building near the Statehouse was evacuated in downtown Columbus. John Gurlach, air traffic controller at the Morgantown Municipal Airport was in a 40-foot-tall tower when the earth trembled. "There were two of us looking at each other saying, `What's that?"' he said, even as a commuter plane was landing. "It was noticeably shaking. It felt like a B-52 unloading." Immediately, the phone rang from the nearest airport in Clarksburg, and a computer began spitting out green strips of paper -- alerts from other airports in New York and Washington issuing ground stops "due to earthquake." The earthquake caused a stir online, where people posted to Facebook and Twitter within seconds and described what they had felt. The keywords in posts, or hashtags, included "DCquake," "VAquake" and "Columbusquake," an indication of how broadly the quake was experienced. "People pouring out of buildings and onto the sidewalks and Into Farragut Park in downtown DC...," tweeted Republican strategist Kevin Madden. Quake photos and videos also made the rounds. A handful were authentic. Many more were not - they were favorite earthquake scenes from Hollywood blockbusters or footage of people shaking their glasses and plates at an Olive Garden.